Dragons features the 3D computer generated artwork of Chris Richardson! Dragons places each player in command of a mighty dragon. 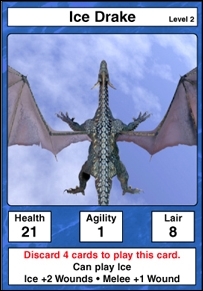 You get to play cards to get a good position on the opposing dragon and let loose with a wide variety of Breath, Magic, and Melee attacks. Dragons features the DIF award winning action/reaction system. This means you get to play a card, your opponent gets a chance to react, you get to react, and so on. This makes for a great simulation of aerial conflict. There are three ways to win. You can inflict wounds on the opponent, tire him, or capture his Lair. 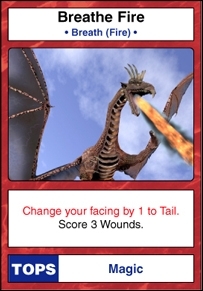 The game comes with 3 pre-built dragon decks for the Fire, Ice, and Lightning dragons. 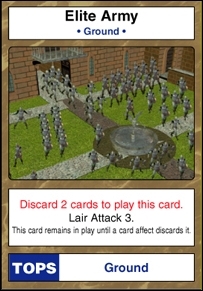 You can also construct your decks using the extra cards included with the game. This gives you all the fun of building your own custom decks, like CCGs, but without the big cost of hunting down all those rare cards! This is a great game for DIF fans, card game fans, and fantasy fans.